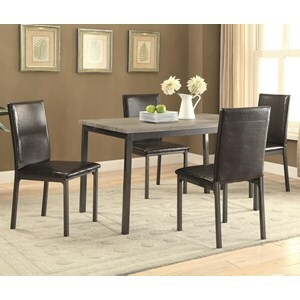 Give your dining room or kitchen style and simplicity with this table and chair set. 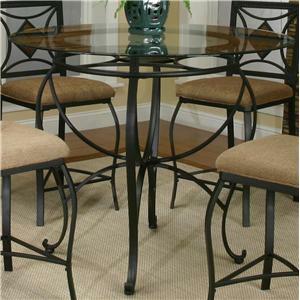 The dinner table features an espresso-colored frame, decorative, checkered middle slate and bevel glass top. The matching chairs come with a wheaten-colored upholster seat and open back with a decorative checkered, square in the middle. 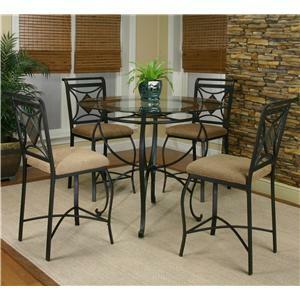 You'll have plenty to be excited about with the addition of this table and chair set. 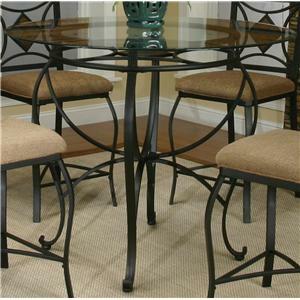 The Cramco Trading Company - Glendale Metal Round Table w/ 4 Side Chairs by Cramco, Inc at Value City Furniture in the New Jersey, NJ, Staten Island, Hoboken area. Product availability may vary. Contact us for the most current availability on this product. 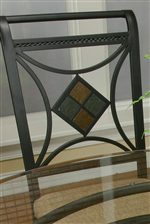 Table Info Espresso-colored frame, decorative, checkered middle slate and bevel glass top. 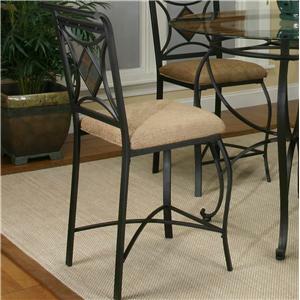 Side Chair Info Espresso-finished frame and features a wheaten-colored upholster seat and open back with a decorative checkered, square in the middle. You'll be set for a place to gather with friends and family with the Glendale collection. The interesting and artful pieces come with an espresso-colored frame as well as a decorative diamond pattern motif spread throughout the tables and chairs. 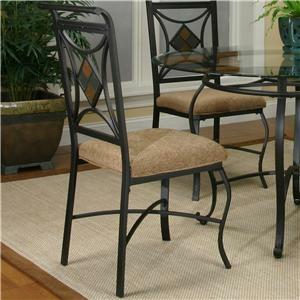 Beveled glass tops and upholstered seats also make the furnishings stand out. 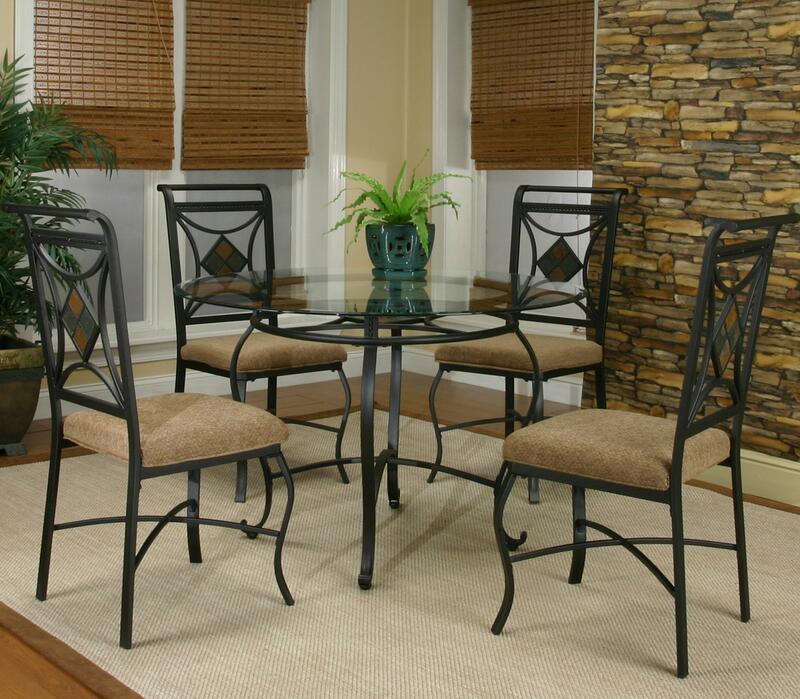 Give your home a casual and inviting decor with help from the Glendale collection. The Cramco Trading Company - Glendale collection is a great option if you are looking for Transitional furniture in the New Jersey, NJ, Staten Island, Hoboken area. Browse other items in the Cramco Trading Company - Glendale collection from Value City Furniture in the New Jersey, NJ, Staten Island, Hoboken area.